1. Preheat oven to 350°. Spray or grease 9×13 pan. 2. In large bowl, combine eggs, oil and water. Add gluten free blondie mix and chocolate chips, blend well. 3. Bake at 350° for 40-45 min. Blondie bars are done when toothpick inserted in center comes out clean. Cool for 15 min before serving. 2. In medium size bowl, combine 1 egg, 1/3 cup oil, 1/2 cup water and 2 1/2 cups Blondie Mix. Stir well. 3. Bake at 350° for 30-35 min. Test with toothpick and cool for 15 min before serving. ◊ Also try adding nuts, coconut, caramel, chocolate chips or anything else you enjoy. I like to make mine with chocolate chips, and serve ice cream with chocolate drizzle on top. You just can’t go wrong with chocolate and ice cream . Enjoy! This rich pudding cake is extremely easy to make and taste great. Check out if the Dove chocolates you enjoy are gluten free. 1. Preheat oven to 350°. Grease 9×13-inch pan. 2. Mix all ingredients in bowl. Batter will appear lumpy. Pour gluten free batter into a greased 13in x 9in pan. 3. Bake in preheated oven for 30 minutes or until golden brown on top. 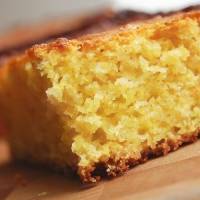 Add Corn – If you enjoy fresh corn in your corn bread, add 1/2 cup of corn. Add Jalapenos – If you enjoy spicy food, spice up your corn bread with a fresh seeded and finely chopped jalapeno. This recipe is literally a piece of cake to make, and you will never know its gluten free. I found this strawberry cake recipe, by Laura Fraembs, in Radish Magazine the other day that looked too good to be true. To my surprise the recipe was gluten-free and literally a piece of cake to make. This cake uses only store-bought gluten free cake mix, frozen strawberries, sugar, flour, eggs, oil, and water. Great cake that only takes an extra 2 minutes to make compared to regular store-bought cake mix. The best part about this recipe is it will look as though you slaved all day over making this fresh strawberry cake with creamy frosting. No worries though, this recipe only takes 5 minutes to prepare and half an hour to cook! **Feel free to use any gluten-free flour you have around the house. Various frosting will work as well such as vanilla, strawberry and chocolate frosting. Low fat cool whip can also be used for a healthier substitute. 1. Preheat oven to 350°. Grease two 8×8-inch pans or one 9-inch spring foam pan. 2.In large mixing bowl, combine gluten free cake mix, flour, eggs, water, gelatin and half of the strawberries. Beat on medium speed for 4 min. Pour batter into well-greased pan. 3. Bake for 30-35 minutes. Complete taste test to ensure cake is cooked thoroughly. 4. Combine frosting and other half of strawberries into bowl and blend strawberries into frosting. Frost cool cake then serve and chill. Enjoy! Note: Be sure to store the gluten free cake in the fridge. I cook this cake for only 30 min, so it will turn out nice and moist. Check out other great recipes at Radish Magazine. This recipe is fun and easy to make, and only takes 15 min!